These files store "checksum" information about files, and will allow this and other applications know if the related files are or not corrupted. You will find oftenly these files in USENET newsgroups and other places, where there is a risk of data loss. So, the original distributor of some files, usually *large* files, will create and also distribute some of these files, so the final recipient of such files can check for the integrity of these. This is very useful, eg, for multi-segment files. When you attempt to join them, if one of them is corrupted, the attempt will simply fail, and you won't know what segment is corrupted. But using these files (md5, sfv or cvs), you can know what is the bad file, and re-download it again, instead of re-downloading all the stuff. You can drop onto checkSum+'s icon a valid md5, sfv or cvs file, and it will check for any file listed there. Please, note that the files in question must be in the same folder as your checksum file. Both csv and sfv formats will generate a 32-bit CRC, which are strong algorithms for file comprobation. But you may choose md5, which is the best format (at least for me). Will be my PC-friends able to use these files? Yes. There are lots of PC-applications out there able to handle these files, such as MD5Summer and QuickSFV. Can I use any md5-sfv-csv file? Not *any*, since there are lots of applications using these algorithms, and each one can generate different file formats. But you will be able to process most of the common formats. If you have a file which you can't process using checkSum+ and you receive a dialog similar to "I can't process this file", then it simply can't be done. You can mail us such file and we'll see if we can implement such format for the next version of checkSum+. BAD means that the file is corrupted. MISSING means that checkSum+ couldn't find the related file next to the checksum. Known issue: under some circumstances, you can receive a checksum file from a PC, and the files listed there contain some special character, such as "á". This character, in macintosh, when received from a PC, will be translated to "·" or anything such as this. 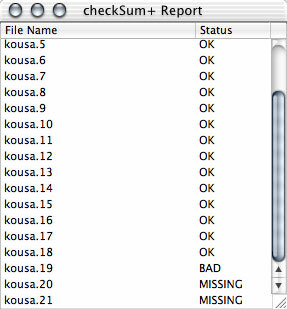 So, checkSum+ will throw a MISSING report for these files. Which, of course, is not real! Simply keep your eyes opened when you received files with strange characters. We also use ed2k_hash (available at SourceForge) to generate the md4 algorithm specific for the mlnet network, and sha2 for all the sha2 algorithms (thanks to Aaron Gifford). - Select (eg) a md5 file in the Finder. - Choose "get info" (command + I). - Go to "open with" and select checkSum+. - Click "change for all". - Repeat these steps with csv and sfv files. 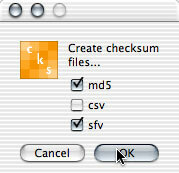 Now, when you double-click any of these files in the Finder, they will be automatically opened using checkSum+. You will also see now an identifier icon for this kind of files. -Mac OS X 10.6. Previous OS and architectures, please download version 1.5.2. This product is freeware, use it at your own risk, blah. You may not try contacting us about this product. But for feedback, suggestions, bugs, donations... Mail us! -ed2k_hash upgraded to 0.4.0 and intel-ized. -Fixed little bug with the logging system (error message the first time you activated the logging options). -Added logging options (see prefs). -Fixed bugs with large md5summer files: checking and reporting. -Added support for non-binary-mode md5 files. -Added support for Easy MD5 Creator md5 files. -Added support for certain CSV files. -Added support for NFO Sighting SFV files. -Fixed minor bug checking WIN-SFV32 files. -"All OK" message is now optional (new pref). -Progress window is now resizable. -Now, dropping a folder will create a md5 hierarchical file. -Now, you can drop and browse several files in the explorer window. -checkSum+ requires again "ed2k_hash". This fixes uncompatibilities between both MD4 and MD4-mlnet algorithms. -We have added some more MDs to the explorer (SHA2), using sha2 by Aaron Gifford. -Made some modifications to MD5-generated files, for *nix compatibility. -checkSum+ no longer requires "ed2k_hash". -Under request, we have added lots of checksum formats to the explorer window. -Now, you can configure checkSum+ to open the explorer window by default. -Adds support for certain csv files. -The explorer now will show also the md4 sum of dropped files (edonkey). -Under request, displayed algorithms on the explorer window are optional. -Adds support for certain md5 files. -Some cosmetics: now you can close windows via apple+w, cancel checksummings closing the progress window, resize correctly the report window and every time you open the explorer window, all fields will be empty, so you don't get confused with the last checks.